The spectrum of machine learning and computing includes, but is not limited to, data collection, data preparation, model building, training and application deployment. While it has been around for years, machine learning and computing has attained new popularity and is used in a wide range of applications today as artificial intelligence (AI) has become more prominent. As the practicality of using these kinds of systems increase, machine learning and computing is projected to grow exponentially. 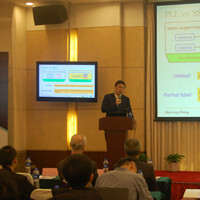 2020 12th International Conference on Machine Learning and Computing will be held in Shenzhen, China on Feb. 15-17, 2020. The International Conference on Machine Learning and Computing (ICMLC) will provide opportunities for researchers in this field to share their ideas and reinforce collaboration since 2009. As such, the conference has achieved a remarkable number participants while also enabling profuse exchanges among academic and industrial researchers over the years. » ICMLC 2019 ACM Conference Proceedings (ISBN: 978-1-4503-6600-7) has been published, will be included in ACM Digital Library and indexed by Ei Compendex and Scopus soon. Full paper submission or abstract submission deadline. This is the previous conferences photo gallery. You could know more about the conference history.